I'll give a bit more info: Sammy Jo Fuller is actually Sam's biological daughter through a leap, not through Donna. "Trilogy" revolved around a girl/young adult named Abigail Fuller. Sam leaped into her life three times: first in 1955 as her father when she was about 10 years old or so (Part I), then into her fianc? in 1966 when she was in her early 20s (Part II), and finally into a lawyer who defended her in 1978 when she was in her 30s (Part III). That should bring you up-to-date! You definitely owe it to yourself to watch that 3-parter when you finally see it on Sci-Fi or whatever. It was very memorable! Thanks for all the info. Between this and the episode guides I was able to figure it out. Makjes it much easier to understand the many possible movie plot discussions!! Thanks for the help! See! I know I wasn't alone! (I may have to take that weekend off from work so I can watch them all! Scott has been added now, too, or did someone already mention that? Hi.... I noticed on IMDB.com that Kimberly Cullum is now listed to play a character called "Donna Fuller." Does anyone know what that is about? This was under the cast and crew section of the movie "Quantum Leap: A Bold Leap Forward." Earlier, she had been listed as playing Sammy Jo Fuller. I wonder who changed that listing? Does anyone know anything about this? I'm just curious.... Thanks! It wont be the same with diferent people. Maybe they should let it lay. They said the same thing about Star Trek: The Next Generation. Besides, Don Bellisario is behind the wheel of this project, and Dean IS going to be involved, with Scott still making appearances from time to time. I would hold off judgment until it actually airs. Of course, it's not going to be the EXACT same as the original... but you never know, maybe it will be even better. It at least deserves a chance to get out of the door. I'm looking forward to it immensely!! I need SOMETHING to live for after Star Wars episode 3 comes out!! Mind you, I've also got the new Dr Who to look forward to, too!!! Cant wait for new QL, tho!! I need SOMETHING to live for after Star Wars episode 3 comes out!! I have been a Star Wars fan my whole life. I have been speculating about the events of Episode III for years. I am actually planning on going to the Star Wars Celebration in Indianapolis in April. I have never really gone to any type of convention before, but it is a once in life thing with this being the last movie. Hi all. 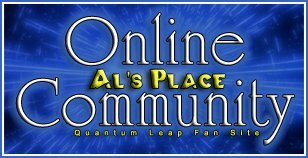 I'm a huge Quantum Leap fan and creaming myself over the possibility of the TV movie / new series. I read some good points about Sammy Jo being too old to be the new leaper if the movie/series was set 20 years after Sam disappeared, but if a daughter had been conceived between Donna and Sam on the Leap Back she'd be just the right age. My theory is that YES Sam and Donna conceived, and this child will be the new leaper. I also think that Sammy Jo, who is working on Project Quantum Leap, will be her hologram. This would work out well because Sam's hologram, Al, is much older than Sam, as is Alia's hologram Zoe. The interview specifically says that it's Sammy Jo Fuller (the same Sammy Jo that we saw in Trilogy) and that she is a 20-something college student in present-day (2005). Yet, according to canon, Sammy Jo was conceived in June 1966, which would make her date of birth approximately March 1967. No amount of time-travel can alter the date that someone was actually conceived, otherwise it would be a completely different person genetically. The only thing that would make sense to me is if Sammy Jo's physical body got displaced in time sometime after 1978; like if someone leaped into her and they got stuck, or if they died or something and caused Sammy Jo's aura to "relocate" in time respectively. Even though it's science fiction, it has to be somewhat believable for it to make logical sense. I had posted my theories on this a while back, but I think they got lost in the crash. Since Al is supposedly going to be a professor at a college, this gave me a little idea that could maybe make a good fan-fic. I just watched "Another Mother" again last night (one of my favorite episodes), and thought it was sad that the series never had Al keep his promise to Theresa that he would be back. The episode took place in 1981, so I was thinking that Theresa could be in college in present-day (she would probably be around 25 or so) and have Al as one of her teachers. In a way, Al does come back into her life and they recognize each other. Maybe Theresa could even become part of Project Quantum Leap as well. It would also be a good way for Don Bellisario to have his family back in the series even if he isn't directly involved. Meanwhile, my little brain is pondering what would lead to Al teaching college. I think it's because he wants to stay close to Sammy Jo. Being a college professor makes it easier for Al to keep an eye on her. Now the question is, what would Al teach? Let's hope it's not Human Sexuality! Well you know the Admiral is a jack of many trades and master at none. I think he will teach History. Of course! I don't know how I didn't think of that. What would be more ideal for Al to teach than History, especially since his mind is refreshed from all of those leaps? LOL Think the classroom scenes in Raiders of the Lost Ark. That's exactly what I thought of! LOL. I also thought if Sam ever did get back from leaping, would he teach in a classroom? I envisioned 'Raiders' then too!